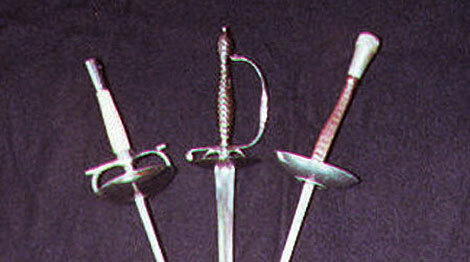 Left to right: A 1960’s Italian foil, a 1790 English small sword, and a modern French foil. it appears that Philibert de la Touche (a very appropriate name for a fencer!) first mentions the use of foils at the court of Louis XIV in his “Les Vrays Principes de l’Espée Seule”. They were notable for their elaborate crown-shaped guards. 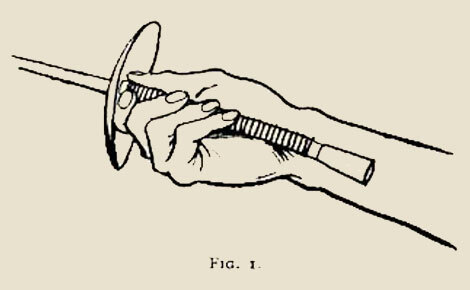 Traditionally it is considered that they were introduced as a safe alternative for learning swordplay. However, practice smallswords and rapiers were being made for that purpose. Some modern opinions suggest that it is more likely that foil was developed purely as a game, right from the start, to entertain as well as show swordplay skills. Monsieur Labat confirms these rules in his “L’Art En Fait d’Armes”. 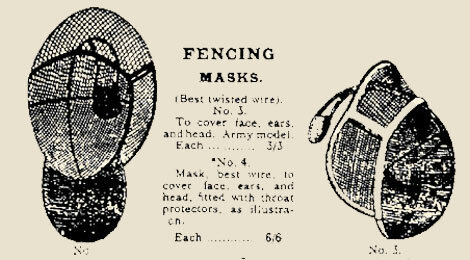 Most of these would be instantly recognisable to the modern fencer. 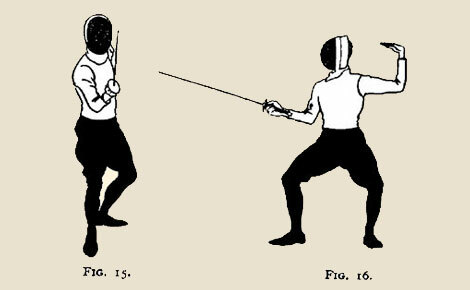 Sir William Hope describes the rules in his “A New, Short, and Easy Method of Fencing”. Hits to arms and legs were allowable, but only as preparations, not final counting hits. The tips of the foils were dipped in vermillion to clearly show where the hits landed. Bouts were limited to 5 or 6 hits. The face mask is re-invented by a Mon. La Boessiere (the ancient Egyptians were using something similar! ), but not readily accepted. Mon. Domenico Angelo writes his famous “L’Ecole d’Escrime”. Mon. Boessiere’s son writes his “Traité de l’Art des Armes”. Foil was still about a display of skill, La Boessiere advocated that fencers did not advance or retire at all during their bouts. Indeed they were expected to finnish exactly where they started! Le Capitaine de Bast introduces the “Grand Salute” in his “Manuel d’Escrime”. the mask is now in common usage. foil matches were proceeded by a display of skills called the “tirer au mur” followed by the salute. Mon. Robert Houdin demonstrates an electric scoring apparatus for fencers. First annual competitions at foil and sabre are held at the Royal Military Tournament. familiar white canvas jackets appear. foil points covered with a black, marking substance. Mon. M. Jongen demonstrates an electric scoring apparatus in the “Liége Journal”. Good for trivial pursuit games as a candidate for a famous Belgian. H.G. 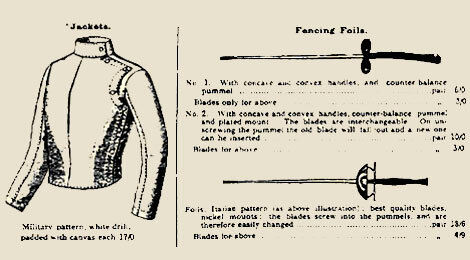 Willink illustrates H.A.Colmore Dunn’s “Fencing; the All-England Series”. Here showing supination and pronation. 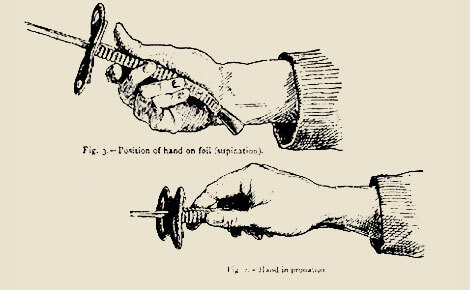 Mr. Muirhead Little demonstrates an electric scoring apparatus at Bertrand’s fencing rooms, London. Used a modern style metal lamé jacket. poo-pooed by the French it never took off. Britain: Amateur Gymnastic & Fencing Association draws up first civilian competition rules. 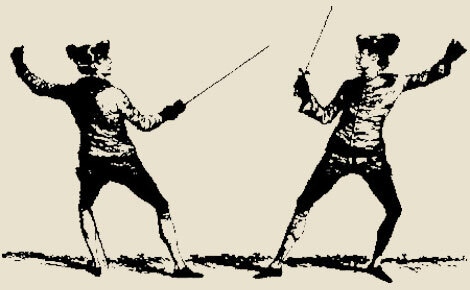 Britain: Amateur Fencing Association Formed. The Army and Navy catalogue, sports section. The AFA changes its rules from a limit of hits (usually 3) to a limit of time (5 minutes) so as to exclude less skilled players winning on “lucky” hits. the French Ministry of War extended the foil target area to include the groin and upper sword arm. The Olympic Committee revert to the old target. the French withdraw from the Olympics in protest! The Fédération International d’Escrime is formed to settle the row. Cav. Léon Bertrand publishes his “The Fencer’s Companion”. here illustrating the position of quarte for foil. World Championships held in Lausanne. the first successful demonstration of electric jackets. a period French foil grip. The FIE give an approval of the electric scoring system. the 1955 World Championships being the first full trial. The FIE formally approve of the electric scoring system. Saxon Fencing Club is first established in Ealing: Chris Clark actually formed the club after himself and others were in a fencing evening class held at Ealing Technical College. But the class was having to close. 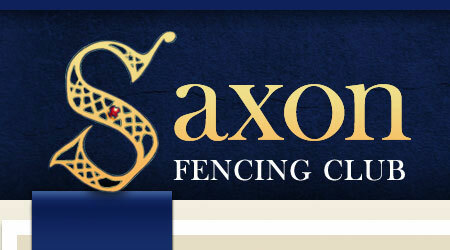 So, being very keen to continue fencing but having no venue, Chris’ parents offered a room in their house in Ealing and that is where Saxon Fencing Club Started. Wilkinson Swords carry out an appraisal of a radio controlled systems. thwarted by the possibility of interference (aka cheating!!). Britain: Amateur Fencing Association changes its name to British Fencing Association. The race is on to make a viable clear mask, so TV viewers can see the whites of our eyes. Hopefully increasing the drama, and thus enticing bigger audiences.